As water becomes increasingly valuable, golf course operators are experimenting with a range of strategies to use less. Specialized irrigation systems and precision application. Greater use of reclaimed water. Development of drought-tolerant turfgrasses. Palouse Ridge, owned by Washington State University and located on the northeast portion of the Pullman campus, was built with conservation in mind. Wetlands were preserved and now serve as water hazards. Native grasses outside the fairways were left largely intact. Special sensors track soil conditions and the course’s roughly 2,300 sprinkler heads can be individually controlled for precision watering. But most of America’s courses were built decades ago, when water use issues were less prominent. Trade organizations have since made conservation a top priority and are pushing for greater research into practical strategies ranging from moisture-thrifty course designs and specialized irrigation to development of turfgrasses that require less water. William Johnston, who retired last year from the WSU Crop and Soil Sciences Department, and research technician Charles Golob ’79, ’86 MS spent a year testing the effectiveness of irrigation soil sensors. Their research plot located just west of Palouse Ridge includes sensors at varying depths that monitor everything from soil temperature to moisture content, enabling them to know when and where water is most needed. Johnston says the sensors helped reduce water use by about 25 percent while maintaining robust turf conditions. The key was precision watering. Newer irrigation systems, like at Palouse Ridge, use individually controlled sprinkler heads rather than multiple-head irrigation zones. “That’s important because you may only need water in one area at a particular time, but if you’re having to run an entire zone it means you’re over-watering everywhere else,” Johnston says. He and Golob predict that computerized irrigation systems soon will be making those kinds of adjustments automatically based on the readings from soil moisture sensors. So far, sensor technology is being embraced primarily within the agriculture industry and other commercial irrigators. Johnston hopes affordable residential versions will be developed and embraced by homeowners and others. Science is just one piece of the puzzle. Much of the transition will involve consumer acceptance as well. 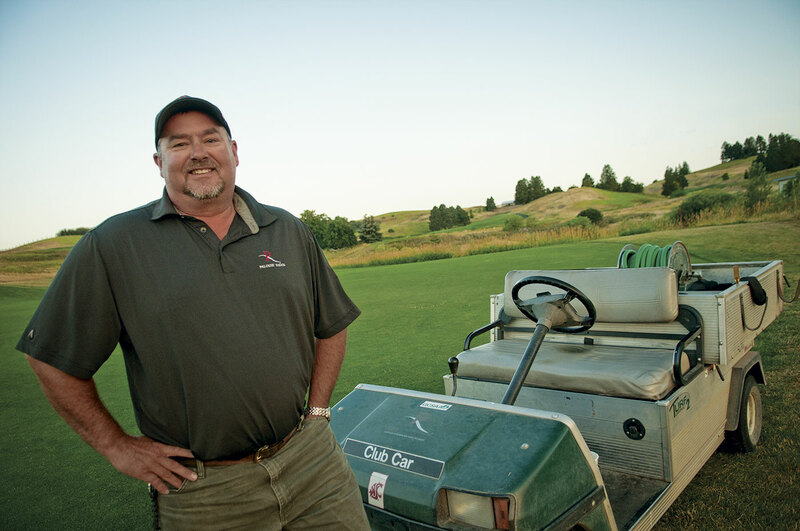 Golf course operators, for example, often find themselves caught between competing expectations. On the one hand, they’re asked to become better stewards of community water resources while at the same time somehow preserving the lush conditions that have become symbolic of U.S. golf courses. Back at Palouse Ridge, finding ways to reduce water use is a continuing exercise. Bednar says about 250 of the course’s sprinkler heads have been turned off after watching golf patterns to identify areas that aren’t being used. Also, the course discontinued watering much of the driving range, turning on sprinkler heads only at specific target areas to help golfers track their shots. 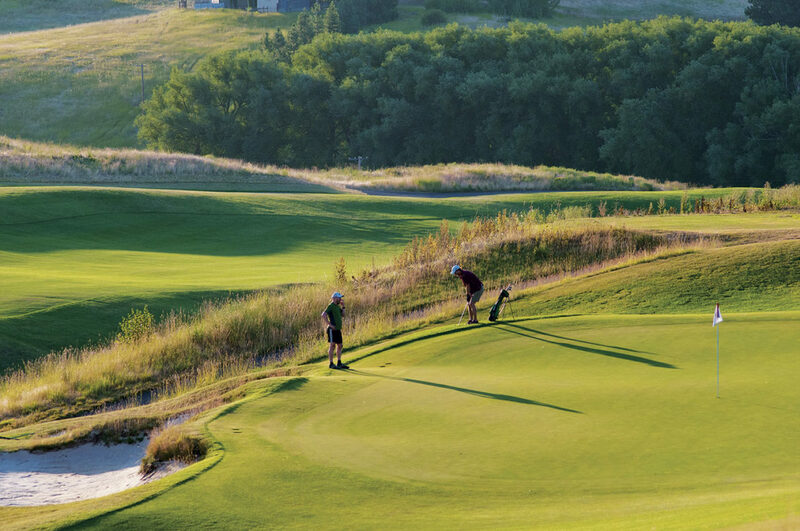 Palouse Ridge is equipped to irrigate with recycled or reclaimed water but Pullman lacks the infrastructure to get it from the city treatment plant across town to the golf course. “We want to use as little water as possible,” says Bednar, explaining the course is just in its second season of using the new irrigation software and wants three to five years of data before making comparisons.